As I discussed in From Novelty to Necessity, I had designed and 3D printed several copies of a reed switch holder for the Y axis of our Electro Tennis rigs. I didn’t address the fact that I also printed a modified version for the X axis; I just simply didn’t have the photos and I always like to have photos of things I write about. 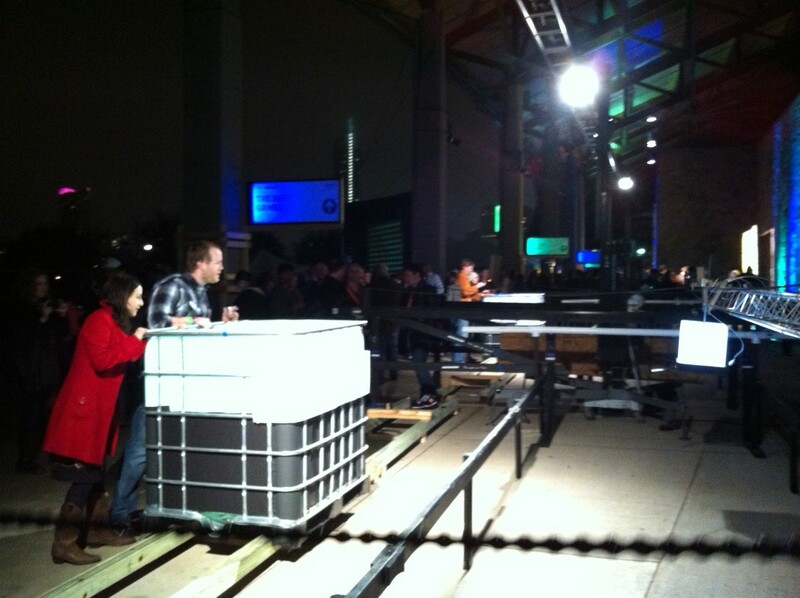 For the past 14 years, the company I work for, frog, has been hosting the SXSW Interactive opening party. For the past three of those years I’ve played a role in it: brainstorming installation ideas, and building/coding really cool experiences for our thousands of attendees. This year the core concept was turning digital experiences into analog ones, and vice versa. Additionally, one of the consistent themes of our party is to play with scale. So one of the experiences we set out to build was “Electro Tennis” (an electro-mechanical version of the classic Pong video game). But we decided to build it on an enormous scale — two 30′ x 25′ playing “courts”, each with a 12″ cube for a ball and 4′ x 3.5′ water tank for a paddle. In other words: giant.